John O. 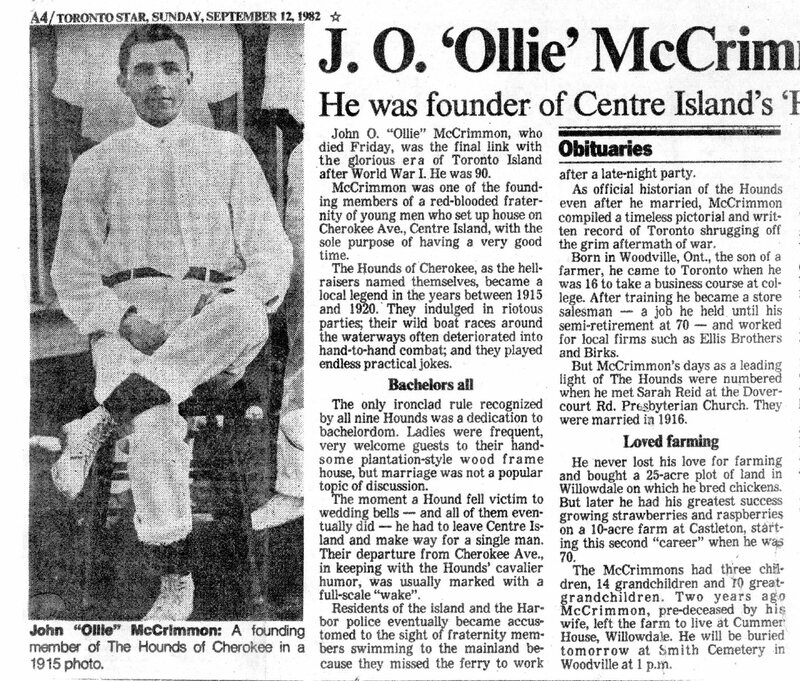 “Ollie” McCrimmon, who died Friday, was the final link with Jorious era of Toronto Island after World War I. He was 90. McCrimmon was one of the founding members of a red-blooded fraternity of young men who set up house on Cherokee Ave., Centre island, with the sole purpose of having a very good time. The Hounds of Cherokee, as the hellraisers named themselves, became a local legend in the years between 1915 and 1920. They indulged in riotous parties; their wild boat races around the waterways often deteriorated into hand-to-hand combat; and they played endless practical jokes. The only ironclad rule recognized by all nine Hounds was a dedication to bachelordom. Ladies were frequent, very welcome guests to their handsome plantation-style wood frame house, but marriage was not a popular topic of discussion. The moment a Hound fell victim to wedding bells – and all of them eventually did — he had to leave Centre Island and make way for a single man. Their departure from Cherokee Ave., in keeping with the Hounds’ cavalier humor, was usually marked with a full-scale “wake”. Residents of the island and the Harbor police eventually became accustomed to the sight of fraternity members swimming to the mainland because they missed the ferry to work after a late-night party. As official historian of the Hounds even after he married, McCrimmon compiled a timeless pictorial and written record of Toronto shrugging off the grim aftermath of war. Born in Woodville, Ont., the son of a farmer, he came to Toronto when he was 16 to take a business course at college. After training he became a store salesman – a job he held until his semi-retirement at 70 – and worked for local firms such as Ellis Brothers and Birks. But McCrimmon’s days as a leading light of The Hounds were numbered when he met Sarah Reid at the Dovercourt Rd. Presbyterian Church. They were married in 1916. The McCrimmons had three children, 14 grandchildren and 10 greatgrandchildren. Two years ago McCrimmon, pre-deceased by his wife, left the farm to live at Cummer House, Willowdale. He will be buried tomorrow at Smith Cemetery in Woodville at 1 p.m.